Amberesque B&B | Mishaps, Muscat and my Crepe idea! 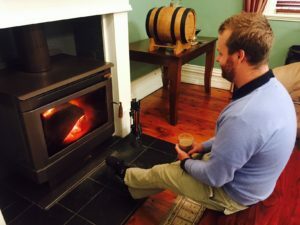 There was a crispness in the autumn air one morning and we were keen to get the fireplace cranked up. After setting up a pile of kindling, tinder and wood, we went for the light… Only to find the smoke would not escape through the chimney, but throughout the entire bank instead! To make matters worse, this occurred moments before our guests were to have their breakfast! Shannon and I were like Basil and Manuel frantically waving the smoke out windows and doors but it just did not want to budge! Thankfully our guests were understanding and sat down to their breaky amongst the smoky haze. With the smoke slowly wafting away it was onto breaky… It was not my morning. I must have had an old batch of eggs or lost my touch. Rather than my usual poaching perfection, each egg I cracked would kasplat in the pan and wouldn’t hold… I went through an entire dozen to get 4 half-decent looking eggs to the guests. It was like those disastrous MKR moments. I served the breaky hoping the guests would not detect the stress on the plate!! But with all these disasters also comes a success story… Crepes! 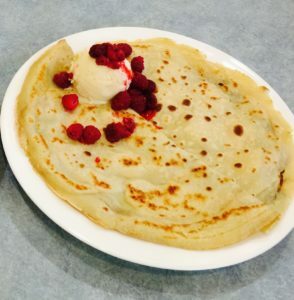 It wasn’t a “crepe” idea after all! And to think I was dreading the utter mess and countless botched attempts at nailing it. Thanks to a fail-proof recipe and my handy crepe making gadgets, I nailed crepe making and actually looked forward to whisking up a batch whenever a guest would select one on the breaky menu. In a large mixing bowl, whisk flour and eggs. Slowly add milk and water whisking until smooth. Add salt and butter and continue beating until smooth. Heat and spray pan to medium high temperature. Pour about ¼ cup of batter into pan and tilt the pan to swirl in a circular motion so that the batter coats the surface evenly. My Aldi crepe maker works great and is super simple to use, but any old flat pan you have will work. Savoury option: During the 1 minute fill one side with a handful of cheese, ham and sautéed mushrooms. Fold over and serve! Sweet option: During the 1 minute spread Nutella and place banana slices around one side. Fold over and serve! Speaking of sugary goodness, when the rest of the world is saying no to sugar at the moment, myself, Shannon, and those that are lucky enough to spend some time in Rutherglen are saying a big yes to sugar! In the form of the golden drop Muscat!! We first discovered this silky, raisiny, heaven-in-a-glass at Stanton and Killeen winery. 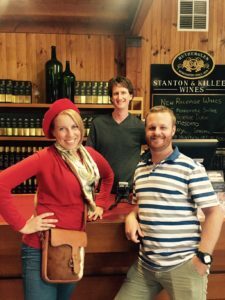 During one of our visits to Rutherglen last year we popped into Stanton and Killeen (S&K) and were introduced to Joe – cellar door and Muscat barrel guru. We instantly hit it off with him as he lathered us up with Muscat and showed us behind the scenes of the winery and their collection of impressive barrels available to purchase! On that visit we promised we would invest in one of their barrels once we had purchased our dream B&B. In our very first week at Amberesque our neighbour introduced himself as Greg. To our surprise he already knew all about us and we quickly discovered the reason why – his son was Joe from S&K! Yes Rutherglen is a very small town! True to our word, we went to Joe at S&K, revisited their selection of smooth stickys, settled on a 23 litre barrel and filled it to the brim with their gorgeous premium Muscat! Since our barrel and Muscat purchase we have become good friends with Joe and his partner Kate – exec chef of Jones winery. Naturally we became instant mates with this wino and foodie – talking olive curing, organic suppliers, babies (they just had a lil girl) and above all… All things wine! One of my aspirations is to reinvigorate Australia’s passion for Muscat and bring it back into its 1980s vogue. I’ve pursued this goal by offering it as the perfect night-cap and hero-Ing it in just about everything … using it to poach fruit, make jams with and even on porridge! Don’t knock it till you try it! P.S. We later discovered that there was a cast-iron baffle in the fireplace that occasionally needs cleaning in order for the smoke to freely escape through the chimney. We’ve cleaned it, and our fire is now cranking away! Joe from S&k: Muscat barrel guru and a great mate! Shannon finally enjoying a smoke free fire. 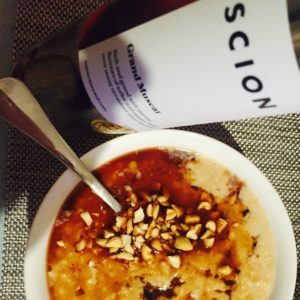 Muscat porridge… a warming start to your day! Did u clean the fire with Muscat too?